Discover how much energy you are losing through your windows - and the rest of your home. Dr. Energy Saver dealers replace windows with energy efficient replacements. Being home energy experts, we also properly seal and insulate the windows, which eliminates that drafty feeling around new or old windows. Call us or contact us online today for a free window replacement price quote. What’s the difference between a window and a replacement window? This is a common question among many homeowners. Technically speaking, windows are installed in new construction, while replacement windows are installed in existing window openings. Replacement windows enable you to enjoy the beauty, function and energy efficiency of new windows without totally removing your old windows. In most cases, only the glazed parts of the old window (referred to as the window sash) are removed. 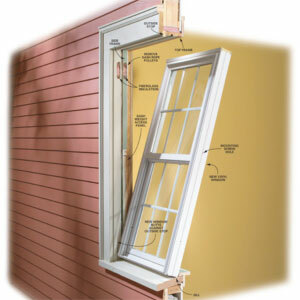 Your replacement window comes in its own frame sized to fit inside the jambs of your old window. The installation work is done from inside your house. No alterations to your exterior siding or trim are required. Many companies manufacture replacement windows, and many local contractors or contracting companies install them. So how can you be sure you’re getting a quality window and a first-rate installation? A new window inside the old one. A replacement window is sized to fit inside an existing window frame after the sash units have been removed. Copyright @ 2002 The Family Handyman magazine. All Rights Reserved. Correct measurements. A replacement window mustn’t be too small or too large for its opening; it’s got to be exactly the right size. Taking proper measurements can be tricky in older houses --especially when window openings aren’t perfectly rectangular. An experienced window technician will be able to overcome such challenges and get correct measurements. Good prep work. A quality-conscious installer will take proper steps to protect your home interior as old window sash are removed and new replacement windows are installed. He or she will also make sure that your existing window sill and jambs are in proper condition to receive replacement window units. Quality window units. Some replacement windows are better than others – much better, in fact. To get the beauty, convenience, energy efficiency and maintenance-free features you value, make sure to read up on choosing replacement windows. Weathertight installation. To eliminate drafts, the installer has to effectively seal all gaps between the new replacement window frame and the old window jambs. This work is typically done with special low-expanding spray foam. Well-crafted finish trim. The last step in the installation process is to install interior trim that integrates your replacement windows with existing jamb and trim details. A skilled installer will be able to execute this finishing touch with a high level of craftsmanship. There are a number of ways to make your new, replaced or old windows more energy efficient. Dr. Energy Saver can help you decide which upgrades are best for your situation. For example, sometimes air-sealing is all that's required to stop air leakage around each window, so it's a good ideal to caulk the trim. Other options are to seal and insulate the shim space and to add window weatherstripping. To access the shim space, the window casing (trim) will need to be removed. The same casing can usually be reinstalled after sealing and insulating are done. If your windows are loose in their jambs or don't close securely, weatherstripping will reduce energy losses significantly. Dr. Energy Saver will determine which types of weatherstripping are compatible with your windows, and then properly install the weatherstripping to help make your windows perform better. This video talks about installing low-e basement replacement windows. Replacing your old basement windows can help save energy in your home. Many times the basement windows get overlooked when retrofitting your home for energy efficiency and home energy savings. If your current windows look bad or are rotted or drafty, Dr. Energy Saver has the perfect basement windows for you. New EverLast energy-efficient, all-vinyl basement windows can be installed to replace your old ones. These windows look much better, don't let wind in, have double-pane glass, and never need paint - perfect for the damp environment close to the ground. If you're in need of efficient, attractive windows to improve home comfort and reduce energy bills, Dr. Energy Saver has the services you need. Find your local dealer today and get started with an estimate!